If there's one thing I've learned about my style over the years, it's that I tend to stray towards the classics. My closet mostly consists of jeans, t-shirts, A LOT of sweaters and comfortable (but cute) shoes. Sure, I've definitely worn trendy pieces here and there, but my favorite outfits are always the most basic. Case in point, this outfit. 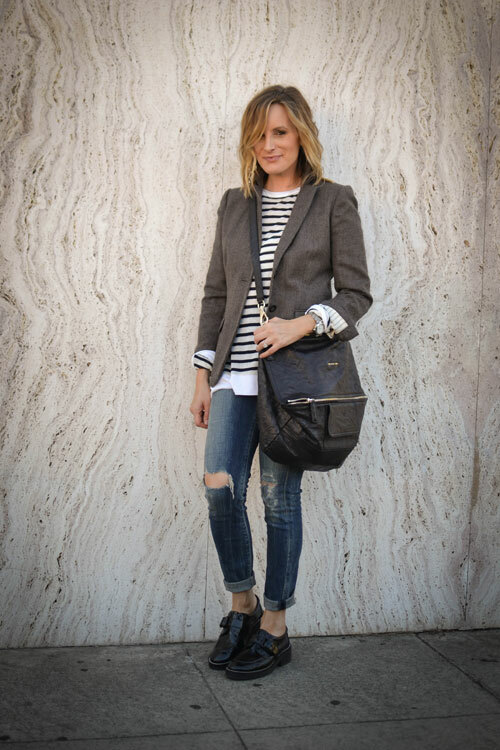 If there's one combination you can never go wrong with, it's jeans, a blazer and a striped top. Accessorize with a great bag and a cute pair of shoes (I can't stop wearing these oxfords) and you're good to go! Fantastic bag and blazer! I like your style very much. I'm with you...I always lean towards the classics. Love the blazer. love the blazer with striped shirt, nice look!